A Mass of Christian Burial will be held at 11:00 AM on Thursday February 7, 2019 at St. Wenceslaus Catholic Church, Milladore, WI, with Reverend John Ofori-Domah officiating. Burial will follow at the parish Cemetery in Milladore. A visitation will be held from 4:00 – 8:00 PM on Wednesday February 6, with a rosary service at 7:00 PM, all at Martens/Rembs Funeral Home, Junction City. Visitation will continue from 9:00 AM until service time on Thursday at St. Wenceslaus Church, Milladore. Deacons Jerry Ruesch and Ray Draeger will assist at the service. Leona was born on March 22, 1912 in the Altdorf community of Sigel Township, Wood County, Wisconsin to Leo and Mary (Huser) Ruesch. She graduated from Wood County Agricultural High School in 1931, from Wood County Normal and earned a degree in Elementary Education from Univ. of Wis. Stevens Point in 1962. She was united in marriage to Raymond J. Shirek on June 25, 1940 in Altdorf. He died on March 11, 1999. She worked as a teacher for various school districts for 34 years, and later as a substitute teacher until well into her 80s. In addition, she enjoyed sewing, gardening, cooking and baking, reading and lifelong journal keeping. She was a member of W.E.A. and N.E.A. and had several leadership positions in 4-H and Catholic Order of Foresters. Leona is survived by her sons Robert (Jane) Shirek of Fond du Lac, WI and Leo (Luci) Shirek of Black Earth, WI; Grandchildren Andrea (Keith) Statz of New Richmond, Annie (Paul) Schmidt, Waukesha, and Gregory (Jennifer) Shirek of Fitchburg; Six great grandchildren include Derek and Genevieve Statz, Trey and Jackson Wisner, and Elise and Abrielle Shirek; Ninety-seven neices and nephews. She is also survived by 3 siblings: Anthony (Muriel) and John, and Inez Krohn. She was preceded in death by her husband Ray in 1999, a son Harold in 1983, and a granddaughter Susan Kay Shirek in 1979. Eight deceased siblings include: James, Leonard, Fredolin, Myron, Thomas, Clement, Clara and Ione. Memorials may be made to St. Wenceslaus Church, 146 Main St. Milladore, Wi 54454. The family wishes to extend a special thanks to Portage County Health Care Center. Special thanks go to neighbor friends Ellen Moscinski, and Mary Jo Sternitsky whose faithful assistance made it possible for Leona to live in her home until she was 105. 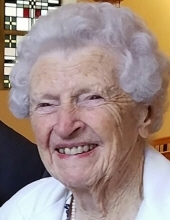 "Email Address" would like to share the life celebration of Leona C. Shirek. Click on the "link" to go to share a favorite memory or leave a condolence message for the family.